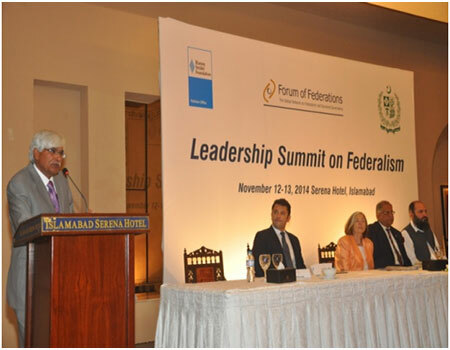 The Forum of Federations in collaboration with the Ministry of Interprovincial Coordination and the Hanns Seidel Foundation hosted a Leadership Summit on Federalism on the 12-13 November in Islamabad. 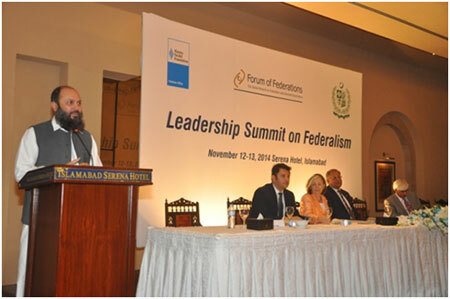 The Leadership Summit on Federalism brought together senior federal and provincial leaders from across Pakistan to discuss the challenges faced by the federation in intergovernmental coordination and practical implication of devolution in fiscal management related to the sector specific areas of education and natural resource management as it moves forward with the devolution of power contained within the 18th Constitutional Amendment. The Forum of Federations Chairman, Prof. Dr Georg Milbradt opened the Summit and highlighted the work of the Forum of Federations around the world and its mandate of sharing the global experiences of federal countries for partners, such as Pakistan. He spoke of the importance of federal institutions to the function of government, building consensus and implementing reforms. He indicated that supporting institutions and the work of the departments like the Inter Provincial Coordination (IPC) and Council of Common Interest (CCI) was crucial in the case of Pakistan and its efforts to implement democratic devolution, these government institutions are critical to the successful transfer of power and function of lower levels of government”. Prof. Ursula Männle, the newly elected chairwoman of the Hanns Seidel Foundation, reiterated the fact, that there was not one blueprint for federalism. She pointed out to certain parallels in the devolution of powers from the centre to the provinces worldwide. Countries should not be afraid of devolving power, as this had led to the strengthening of the federation in every single comparable case. The Federal Minister for Planning, National Reforms, and Development in his key note addressed the continued efforts in implementing the 18th Amendment and commitment of the federal government to work with all federating units through the IPC and the CCI, as Pakistan’s peak intergovernmental forum. He signaled his hope that this event prove effective in building the capacity of federal and provincial institutions, “I encourage that this gathering utilize this opportunity to explore new and informative ways to move forward in resolving the challenges of implementing devolution”. He described federalism and democracy as deeply intertwined in Pakistan – with the blooming of democracy in the country – more steps should be actively taken to also strengthen its federal structures in their institutions. Using Pakistan expertise and international best practice, the summit provided dialogue and examples of IGR institutions and coordinating government policies in both public discussions and closed working sessions with senior officials. During closed working sessions, officials and experts from all federating units in Pakistan had in-depth discussions on how to tackle the immense challenges involved with intergovernmental coordination relevant to the implementation of devolution. At the end of these working sessions findings were announced at the closing ceremony of the summit. a. Inter Governmental Coordination: A Secretariat of the Federation could be formed to include the CCI, NFC and Economic Council. This would be jointly convened and managed by the provinces and the federal government. The consolidation of these institutions into one executive fora would be an effective method to gain political support and credibility. Most importantly this would consolidate these institutions ansdaid these efforts to move forward with the work of coordinating roles and responsibility and policy decisions between jurisdictions within their specific policy areas. b. 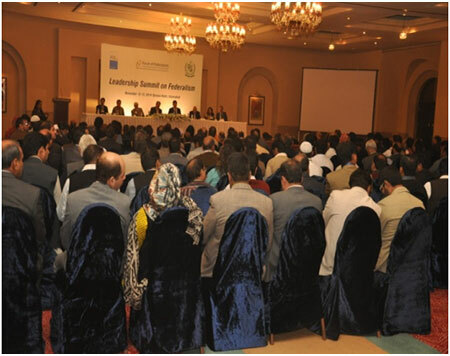 Natural Resource Management: That the control and management of natural resources should be vested jointly with the provincial and federal governments as indicated in the constitution under section 172.
c. Education Policy: Here the findings on policy approach in the education sector were presented in four areas – i. Legislation, ii. Implementation, iii. Curriculum and iv. Funding. i. Legislation in education must be completed by all provinces and federal units. ii. Provincial sector education specific fora should be enabled such as Inter Provincial Education Ministers meeting (IPEM) to coordinate a national standardized test approach. iii. Provincial Finance Commission should be enabled and tasked with funding and oversight of this sector. Funding should be distributed by the districts and based on the number of school age population enrollments. At the closing ceremony Minister Pirzada of the IPC praised the work of the summit in helping to developing in depth understanding of conflict resolution in inter-governmental relations and fiscal management. He further stated that it was the vision of the Mian Mohammad Nawaz Sharif, Prime Minister of Pakistan to involve all stake holders and reduce disparity among the provinces and that all disputes should be amicably resolved with consensus through the CCI, so that Pakistan should realize its future as a prosperous and a true democratic and federal country. The Minister of State for Petroleum and Natural Resources, Jam Kamal Khan in his address spoke of the importance of cooperation and coordination from all Pakistan governments to realize the potential of its natural resources to promote economic development. He commended the work of the IPC and CCI to date and highlighted the important role that these institutions played in realizing federalism and democracy in Pakistan. The Secretary for Inter Provincial Coordination, Ejaz Chaudhry concluded the summit; he welcomed the deliberations and report findings from the Summit, and further reinforced the departments commitment to devolution contained within the 18th constitutional amendment and such activities as the Leadership Summit. 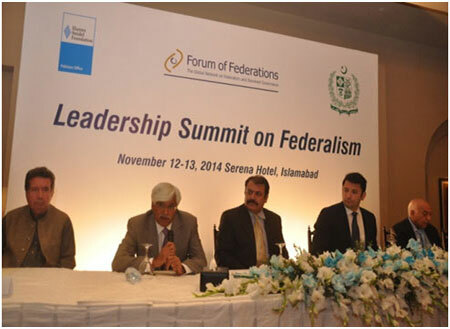 Pakistan is a partner country of the Forum of Federations.